Olha só ali no cantinho, em cima... é o Marcelo!!! Minha pagininha na capa, ADOREI!!!! 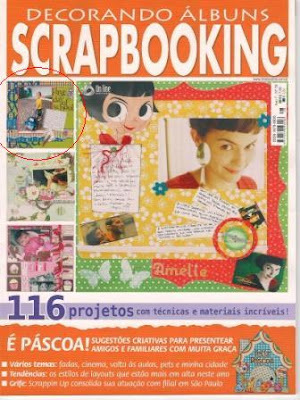 This is the new scrapbooking magazine, take a look at the top left corner, my little boy! That's my page on the cover! Loved it! Que surpresa boa ver meu trabalho na capa! Essa página da capa acabei não fotografando, mas depois eu posto aqui. What a great surprise to see my page on the cover! I will post a picture of it as soon as I get it back and take a picture. When the editors asked for a page Fairy Tale themed, I almost turned it down, as the princessess fase around here is long gone. But then I had this idead of making a LO about my niece Isabella and my son. 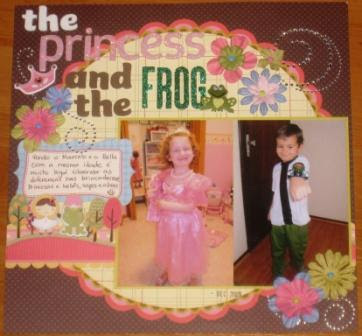 They are the same age, 4, and she is sooo girlish, loves princess and everything pink, and he is Ben 10 and Spider Man! And I thought this tittle was so much fun! lol I just have to take another photo of the LO. PS: É Hora do Recreio no Scrap Playground, não deixem de passar lá! Dé parabéns!!!!!!!!! Adorei o LO da princesa e o sapo hehe E já estou fazendo o LO pro desafio lá do Scrap Playground, tento não perder nenhum. Bjos! Eu adorei!!!!! O titulo então que barato. Quero comprar a revista para ver mais de pertinho.